I ALWAYS tell my students, almost all of them in their teens that, at this point in their lives, they probably enjoy spending more time with their barkada—with whom secrets are shared, ‘happenings’ are enjoyed, and brave youthful explorations are carried out—than with their family members, especially the oldies, whom they perceive as KJ, epal, and close-minded. I remind my students though that, as I myself would find out myself when I was a teenybopper no more, many friends come and go, while the family, fortunately or not, remains. I was browsing though old photo albums the other day to look for pictures we need for our parents’ golden wedding anniversary next month when I noticed in the prints someone who has always been present in important occasions like birthdays, graduations, and weddings. He has been there during happy moments, but even more in difficult ones. He is a vital constant in our family. The second youngest in a brood of nine, German Nicolas Labayog was the only among his siblings who lived with his parents, my lolo and lola, until their twilight years. He took very good care of them. He gave them all the reasons to be happy. He always made them laugh even as he constantly reminded the octogenarians to wear their pustiso. With our grandparents gone, Uncle Gerry, although now based in Hawaii with his super beautiful wife Auntie Elsie, is the unifying force in the Labayog Clan. He would encourage us to gather and celebrate as a family, occasions big and small. He would not be physically present anymore, but we would always feel his love. He would know if some members of the family are at odds, and would go at lengths to negotiate peace. I and my cousins each have our own stories to tell of gratitude and appreciation of Uncle Gerry. He tells you he is proud of you, and you would feel that he means it. He gives sound advice in a very tempered way and helps you realize your follies but never judges. He has ultimate belief in one’s capacity to do good. FOUR human beings pervade my consciousness these days, and they happen to be all mothers. First is Tina Tan, whose recent appointment as Tourism Officer of Ilocos Norte made me so happy, I almost had permanent cramps on my facial muscles due to oversmiling. Thanks to Manang Imee for getting only the best and the brightest to work in the bureaucracy. I can name many a reason why Tina is best fit for the job, but I will limit my list to only three due to lack of space. First, she loves Nature, being highly involved in ecotourism and environmental protection groups. And she goes beyond lip service. My students she led in a mangrove cleanup in Pasuquin would attest. Secondly, I think Tina has reached a point in her life when acquiring material possessions is no longer the order of the day, as she and her husband are a highly accomplished business team. I am not saying the rich don’t steal–the case of Manny “Dagat ng Basura” Villar belies this–but I think Tina is so accomplished in her life (finances, family, romance) that she really just wants to contribute something good to the community. I can vouch for Tina’s integrity. I dare predict she will not be corrupt. Her son Eugene, a very unassuming and respectful boy, is my student at MMSU. Eugene shows how successful Tina is in her most important role–as mother. Third, and most importantly, Tina Tan is most fit for to be tourism officer of this beautiful province because she is a woman who knows how to celebrate life in ways big and small. From food served in A-restaurants to dirty ice cream and ice scramble sold in the streets, from high fashion to indigenous stuff in the mountains of Adams, from Kings and princes to paupers like me—Tina Tan finds something interesting she is generous and vivacious and childlike enough to share to the world. How do I know a lot about her? I am a fan of her Blauearth blog which I have previously featured in this space, and this forces me to name a fourth reason, although I only promised three. Tina Tan sends the message across clear and perky enough to attract men and women from everywhere to go pack their bags and explore Ilocoslovakia. Salamat, dear karikna. 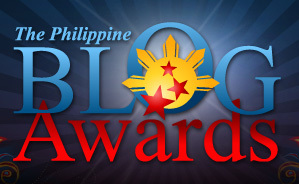 Our blog is one of five national finalists in the 2010 Philippine Blog Awards — Society, Politics, and History Commentary Category. Awards Ceremonies at RCBC Plaza in Makati on Sunday, Dec. 12, but am too busy to go. Of the five, I seem to be the only one who comes from outside Metro Manila.